Mom: Who's on the phone? Me: I AM ON THE PHONE. Steve: Oh, hey sister. What's up? Me: I need to talk to Mom. Mom? Me: Gahh can you get her? I have to tell her what train we're taking! It's times like these that I love living back in the States. Chris and I are headed up to my parents' for Thanksgiving in a few minutes. Wishing you and yours a really fun turkey day with the goofiest people in your life. Happy Thanksgiving! So last night I decided that I should clean out my hall closet. And the kitchen. And, well, the entire apartment. Oscar found one of the bags I use to bring groceries home and spent the evening hiding in it and escaping from it. I had to capture some of this on video for Oscar's fan club. Oscar in a bag, part 1 from Jen Epting on Vimeo. Oscar in a bag, part 2 from Jen Epting on Vimeo. 1. I'm working like a crazy person. Actually, probably more than a crazy person. I'll just put it this way- the past few days have been bed-work-bed-work-bed. Off to work in a minute. Again with the working! 2. I have been cleaning my apartment like a crazy person. Or a person whose landlords need to show her place all the damn time. Oscar is shedding entire kittens off his back and throwing his litter around like it's a ticker-tape parade. This, as you might imagine, is really helpful. 3. I have been WRITING A NOVEL. Remember that little project? Today marks the day I'm supposed to pass 30,000 words. Sadly, I am only at 18,000. (Please note: THIS IS STILL A LOT). I have lots more to say about Nanowrimo, but at the moment it is giving me a migraine. So... soon! 4. I am never home. Also there are about 16 holidays coming up. I will be traveling to India in two weeks, Kenosha in four, up to my parents' at least twice during that time. But I will be back. Soon. To tell you about people who got engaged and people who tried to guilt me into my HS reunion and people who I randomly ran into on the street recently. It's all exciting! It's so exciting that I'm having more fun being excited in person than on this here blog. That sounds pretty healthy, no? 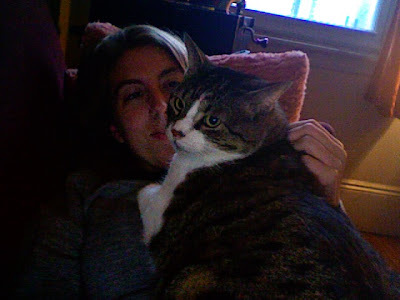 I was doing some software QA from my couch this afternoon and a little friend came to snuggle his face against my face. You'll probably recognize him. At the beginning of this year, I wrote about keeping a small Green Notebook in my bag for moments of inspiration, funny things overheard, a space to organize my thoughts on hectic days. I just finished another one, this time a yellow Moleskin. This one has more ideas for fiction, shopping lists, lists for packing... oh hell, there are tons of lists in this one. Perhaps one of the reasons why 2009 feels like a less stressful and more organized year? This man is someone's father! 3. Share examples- good writing styles, etc. 4. Be available- do my best to get back to them asap. Why do I write? To translate life into words. Widow with her husband's sweat-dried sock. How do we meet someone in a new passion or mode of life and never feel like we're with someone who is unrecognizable to us T-2 years? If you start playing tennis and met a tennis player and start to date him, what happened to the person you were pre-tennis? How do you know if tennis is a phase or if it's an evolution of yourself? What place do your previous hobbies have in your life? ... why is happy less interesting? A boy across from me on the L train (with 2 lip rings) is reading a DK Eyewitess companion book about Beer. Huh? Not Egypt or llamas, but beer! Crazy! ... I have all the bread in the basket to myself and all the butter too. This is the joy of traveling alone. I've been to so many places alone - or with moments alone. I am my own best company. "What does this remind me of?" I think and I already know. Ireland. Or Italy. Or London. I went in a used bookstore and since I have no money, I floated to see if they carry any Charles Baxter... I vow, if I ever publish a book, to seek it out in used bookstores wherever I go, to see if anyone has written sweet messages in the front, to buy the copies if they are looking too dusty to sell. I'd rather be a hot commodity than left to rot on the shelf. ... The bench I sat on in the park, the table at this restaurant, they are both part of my memory. But what of myself stays here? How to find them again = how to feel as though I am not just a visitor, but a changer, a tiny speck of influence, however small. I met a girl called Shoshanda who has four years of travel journals to transcribe. She's a writer. She told me that you can't wait to make what you want to happen come true. You have to take all your dreams and boil them together into one action task. Her task is to transcribe her journals. Director lets the scope of his story influence the plotline?? $ dictates what could happen to the characters. Maybe instead of starting the day positive and being beat down until 6pm, I need to start the day asking "what can I do today to feel good at 6pm?" FYI this was the first day I defined 5 goals daily... I'm still doing this 6 months later! Girls who wear shorts in the rain + sandals. ITCHY. ... so maybe the reason we can get so upset with software is that it often mimics our deepest fears in our relationships. My computer used to freeze and quit programs, I had no idea why or how to fix it or what I'd done to make it act that way. We watch people use insanely old versions of IE browsers or conduct crazy, twisted actions on their own machines because they're afraid of not being able to predict what's coming next. And isn't that what we do in our own relationships? Frank Lloyd Wright's "The Living City"- acres of land for every family. And flying taxis?! How to keep shining a positive light when you don't have enough energy? Readings remind me of being a little kid and listening to stories before bed. "In Mali, your mother is your mother even if her leg is broken." "To answer questions about my creative process suggests that I am conscious of what I'm doing. "The story of immigration is of layers of loss and I hope to explore those layers in my fiction." "Craft is a process of writing sentences that I like. I'm drawn to writers that add elegance to sentences; they nourish and influence me." "I cannot imagine places I have never been." "I explore alternative possibilities to the narrative of my life." "Acting is celebrating the multiple personalities that we all are." - What am I still doing in this dirty, annoying city? - Why is the ACE running so slow? - Why is the L limited again?? If you believe that people are good, can they ever make you upset? Isn't it possible that you can be too understanding of the world around you? What is the balance of what you are entitled to and what you owe? Zen zero. It's funny to see how much of the year I spent thinking about writing, as well as how much time I spent analyzing and planning things. I didn't include any of my shopping lists or five goals or planning lists, but know that they make up a lot of this notebook, particularly over the summer and in the second half of the year. Oscar has had some pinkness happening on his face lately and has seemed kind of itchy so I made an appointment with the vet for this morning. As many of you know, I adopted him almost a year ago from a shelter, who had found him abandoned in the Bronx. If anything is true about Oscar, he surely loves an adventure... which is why, after I got his carrier out early this morning, it was no surprise that he was ready to go. Immediately. Off we went, into a cab that allows pets, and as we got closer to Williamsburg, I mentioned that the driver might want to avoid Bedford. "You know, it's the marathon today," I said. My driver did not seem to understand the concept of 40,000 people running down the road we needed to cross. "Is there another way around this??" I asked. My driver shrugged. I got out. I'll say this. There are many things that one might bring to watch the NYC Marathon. Signs, flags and dogs are among them. Cats in carriers do not, typically, belong on the scene- and I say this because there sure is a lot of SCREAMING. Oscar the Wonder Cat did not flinch. I however, was not managing as well. The trouble with wanting to cross Bedford Avenue on the morning of the marathon is that there is no way to do it. The subway doesn't go underneath it (allowing a prairie-dog-style-pop-up-to-the-other-side situation). And there are runners constantly coming. So I'm standing there on N. 6th and Bedford looking mightily confused when this woman comes up to me and asks if I need to get across. I tell her we do. Then she says she will help me cross, that we will only need to RUN with the RUNNERS for a few seconds diagonally across Bedford. I remind her I am carrying a 15lb cat in a carrier. She offers to hold one side. Ladies and Gentlemen, this is how Oscar and I ended up running in today's marathon. People are screaming and she is quietly saying "not yet... not now... GO, RUN, GO!" and we're off, crossing the avenue with Oscar in hand. PEOPLE. It was exhilarating! What a memory! After we got safely to the other side, I thanked her and showed her Oscar, who nicely sniffed her hand and nuzzled her. UNPHASED BY RUNNING IN A MARATHON, was this cat. Then we went to the vet, where we found out he has a mild case of cat acne and an allergy to his food. In usual fashion, he was adored by the doctor and her assistant and enjoyed hanging out in the waiting room while we awaited a cab for our ride home. I do not know what the odds are of having the sweetest cat in the world, but I think I should probably play the lottery one of these days. While I made banana bread and worked on Nanowrimo this afternoon, our little buddy did a little napping. Big freaking day!